If you’re new to Green Arrow there are just a handful of ideal starting points for you. You probably don’t need to begin delve into his Golden and Silver Age appearances, which continue through 1987. 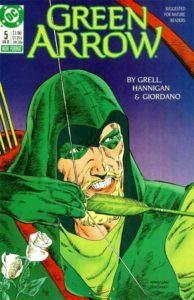 For a lengthy and well-collected run, you can either begin immediately post-Crisis with Longbow Hunters and Mike Grell’s lengthy run on Arrow’s 1988 ongoing. Or, you can start with his 2001 relaunch by Kevin Smith, which continued for several years under a number of authors. Alternately, there are two newer points where you can jump in. 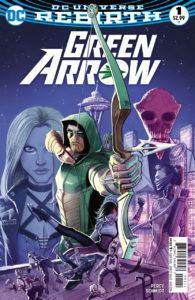 Jeff Lemire’s run during New 52 was widely acclaimed and matches well with the tone of latter seasons of the Arrow television show; it makes very little reference to the 16 issues that preceded it. Or, you can start with Benjamin Percy’s Rebirth run that began in the summer of 2016, which is cognizant of the influence of the TV show but more grounded in the tone of Arrow’s 80s and 90s comics. 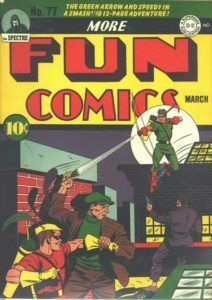 Green Arrow made his first appearance in More Fun Comics (1935) #73 in November 1941, which was also the first appearance of Aquaman! From there, he continued to anchor More Fun Comics as well as star in the quarterly Leading Comics (1941) from its first issue until #14 in 1945. He also joined World’s Finest Comics (1941) with #7 in the fall of 1942 – at that time it was also quarterly. After five years of that status quo, in April 1946 Green Arrow made the jump from More Fun Comics to Adventure Comics (1938) as his primary title with #103 while still appearing in World’s Finest Comics (1941), now a bi-monthly title. That would remain his status quo until June 1958, at which point the primary Silver Age Green Arrow (Earth 1, Pre-Crissi) began to appear starting in Adventure Comics (1938) #250 and World’s Finest Comics #95. After a decade away, the Golden Age Green Arrow made a handful of further pre-Crisis appearances, including in All-Star Squadron (1981). 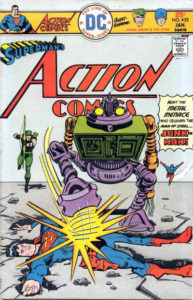 More Fun Comics was an anthology title that typically featured multiple stories in each issue, including appearances by Doctor Fate and Superboy. Featured Green Arrow as part of a team called The Seven Soldiers of Victory – Crimson Avenger, Green Arrow, Star-Spangled Kid, Stripesy, Shining Knight, Speedy, and Vigilante. An anthology title that typically featured a pair of separate Batman and Superman stories in addition to Arrow. To this point, World’s Finest reprints like Archives, Showcase, and DC Comics Classics Library have exclusively featured those stories and not the other characters. Golden Age Green Arrow would later appear in #204 in 1971 via a reprint of Adventure Comics #176. Green Arrow’s stories in this title are very brief – typically 6-8pgs. Reprints of the earlier part of this series generally focus on Superboy stories. Justice League of America (1960) #193: A multiple-earths story that continues to All-Star Squadron (1981) #1) collected in DC Comics Classics Library Volume 6, Justice Society of America: A Celebration of 75 Years hardcover, and Showcase Presents: All-Star Squadron Volume 1. All-Star Squadron (1981) #1 & 13: Showcase Presents: All-Star Squadron (2012) Volume 1. All-Star Squadron (1981) #29, 31, 53, 54, 56, 59, 60, 62: Crisis hits this title with #53. Green Arrow’s status quo didn’t necessitate a major change for the Silver Age the way other DC characters did, and so he leisurely slid into a Silver Age version of himself in 1958 in his ongoing backups in Adventure Comics (without a character change, like Flash or Green Lantern). It is here where classic Green Arrow collections begin. This is a Green Arrow team-up with Aquaman, so it’s also collected with other Aquaman reprints of the period, such as his Showcase and Archives lines. Also collects a famous Superboy/Robin story from #253. Green Arrow later appeared in #419, 423, 439, 461, and 464. This black and white book is the only volume in the Green Arrow Showcase line. Collects Adventure Comics (1938) #250-269, The Brave and the Bold (1955) #50, 71, & 85, Justice League of America (1960) #4, and World’s Finest Comics (1941) #95-140. Green Arrow would later appear in #178 (Batman team-up), 184 (Justice League story), 189 (Justice League story), 210 (Superman team-up, continues to Action Comics #437), and 231 (a Superman/Batman team-up) before returning for a run starting in #244, listed below. Green Arrow was a frequent Justice League member, appearing through the majority of the title’s run from Silver Age to Crisis on Infinite Earths. Green Arrow appears occasionally in this team-up title beginning in 1963 in issues #50, 71, 85, 100, 106, 114, 117, 129-130, 136, 144, 168, 174, 185. 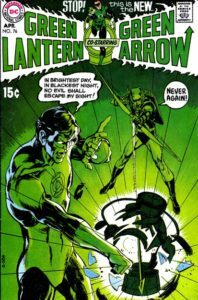 This is a historic run bore the title “Green Lantern / Green Arrow” on its cover, but the indicia was never changed to reflect that as its official title. The first portion of it has been collected in several different ways. #444-446: Not collected. Arrow is back to back-ups, and is written by Mike Grell for the first time (co-writing along with Maggin)! Grell pencils most of the stories from this point forward. Starting with issue #244, Green Arrow appeared in a regular back-up feature frequently co-starring Black Canary. When this run ended, Arrow proceeded directly to backups in Detective Comics, directly below. After this point, Arrow returns for the Batman A-stories in #300 and 302. Starting in #521 in December 1982, Green Arrow appeared in a regular backup feature in Detective Comics mostly written by Joey Cavalieri. While in some cases the Batman stories in these issues have been collected, never does that also include a Green Arrow B-Story – they were completely independent. Prior to this run, Green Arrow’s Detective Comics appearances were #347, 466, & 468-469. #527-534: Not collected. Green Arrow stars in his own limited series in this same period, listed directly below. #535-545: Not collected. Pencilled by Shawn McManus. #551-558: Not collected. The effects of Crisis can begin to be observed in the A-story in #558. #560-567: Not collected. Issue #567 is the final appearance of Pre-Crisis Green Arrow. 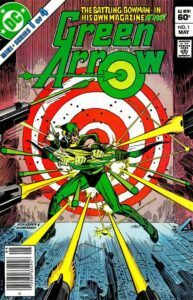 Green Arrow’s first starring series was penned by Mike Barr and beat competing bowman Hawkeye to the newsstands by almost half a year! Green Arrow would continue his back-ups run in Detective Comics after the end of this series. 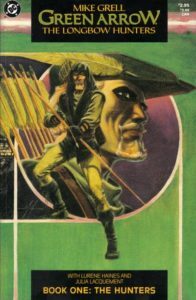 Green Arrow made his post-Crisis debut in the prestige format mini-series “The Longbow Hunters” by Mike Grell, who would go on to write his ongoing title for several years. A prestige-format mini-series Written by Mike Grell, who also contributed covers and some of the pencils! This collection has been re-issued several times since its original printing in 1987. 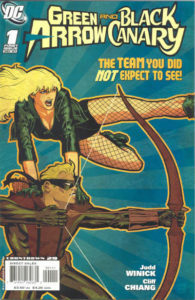 Issue #1 is also collected in Green Arrow/Black Canary: For Better Or For Worse. Writer Mike Grell launched this title fresh from his long-running creator-owned book Jon Sable, Freelance (1983) as well as the well-received Longbow Hunters. It was unusual for the period for carrying a “suggested for mature readers” note on the cover. 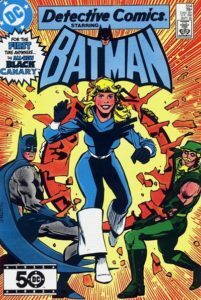 Kevin Dooley writes a handful of issues in the 80s interspersed with Chuck Dixon, who writes through the end of the title. Collects the complete future story. This issue was actually released the month after #137, so it’s truly the final issue of this series. 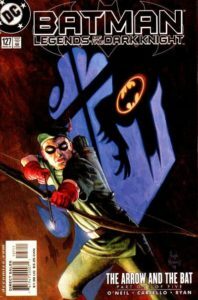 Oliver Queen makes a smattering of guest appearances in this period, most notably in Batman: Legends of the Dark Knight (1989) #127-131, which is collected as Batman: The Ring, The Arrow, and The Bat. See Legends of the Dark Knight for more information. The following appearances have not been confirmed – they could be single panel cameos or non-continuity! : JLA in Crisis Secret Files (1998) #1, JLA: Year One (1998) #11-12, Arsenal (1998) #3, Secret Origins 80-Page Giant (1998) #1, Legends of the DC Universe (1998) #12-13 & 33, Green Lantern (1990) #110, Hourman (1999) #1, 8, & 16, JLA 80-Page Giant (1998) #2, Flash & Green Lantern: The Brave and the Bold (1999) #4, Stars and S.T.R.I.P.E. (1999) #9, Green Lantern vs. Aliens (2000) #1, JLA Secret Files (1997) #3, and JLA: Incarnations (2001) – #1-3 & 5. Some sites also purport that Queen appears in “Silver Age” one-shots in 2000, including 80-Page Giant, Silver Age Secret Files, Doom Patrol, Green Lantern, Justice League of America, and The Brave and the Bold. However, per the title, these might not actually be appearances by Post-Crisis Green Arrow! Conor Hawke makes considerably fewer appearances in this period. Appearances have not been confirmed – they could be single panel cameos or non-continuity! Adventure Comics 80-Page Giant (1998) #1, Arsenal (1998) #2-3, Legends of the DC Universe 3-D Gallery (1998) #1, Secret Origins 80-Page Giant (1998) #1, JLA/Titans (1998) #2, Young Justice Secret Files (1999) #1, JLA/Titans (1998) #3, Green Lantern (1990) #110, Robin (1993) #65 & 78-79, Green Lantern (1990) #117, JLA (1997) #38 & 40, Supermen of America (2000) #5, JLA Secret Files (1997) #3, and Nightwing (1996) #52. Oliver Queen returns to his traditional title, with Connor Hawke occasionally supporting and then appearing regularly from #27-50. This run is kicked off by Kevin Smith, relatively fresh from his run relaunching Marvel’s Daredevil to great fanfare. 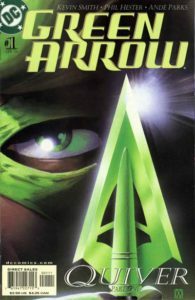 Green Arrow Secret Files and Origins (2002): Collected with his 2007 series in Volume 3: A League of Their Own, below. Written by Judd Winnick. Note that this is listed as “Volume 3” on some sites; it is not. Identity Crisis:See DC Universe Events. Effects of this event began to be seen in Green Arrow #52. Written by Jim Calafiore and Judd Winick. Infinite Crisis: See DC Universe Events. The year of time after Infinite Crisis fits here. 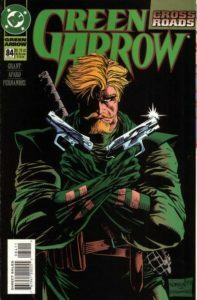 In the missing period of stories, Green Arrow appears in the weekly 52 series in issues #1 and 3. 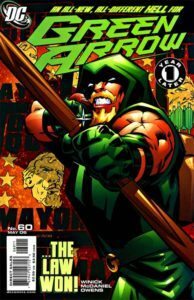 Written by Judd Winick, this one year jump in time finds Ollie as the Mayor of Star City! Collects material from Birds of Prey (1999) #109, Black Canary (2007) #1-4, Black Canary Wedding Planner (2007) #1, and Green Arrow (2001) #75. Continued below in Green Arrow / Black Canary (2007). A series retelling Green Arrow’s first year of adventures, by Andy Diggle. Judd Winnick continues his run on Green Arrow through the hero’s wedding to Black Canary. The respective bachelor and bachelorette parties for our heroes. Andrew Kreisberg takes over from Winick’s lengthy run on the character. 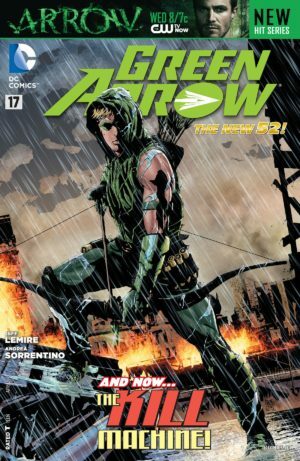 This title experienced a bumpy ride to reach its full #52 issues, undergoing a number of transformations motivated both by writer changes and the increasing popularity of the Arrow television show – which featured a much younger, more cavalier Arrow than the one that directly proceeded this in continuity.. Launched by J. T. Krul and Dan Jurgens, Ann Nocenti took over at #6, and was in turn relieved by Jeff Lemire at #17 with artist Andrea Sorrentino (fresh off of I, Vampire). Lemire and Sorrentino delivered a run that was an instant hit with fans – one of the few breakouts from the middle years of New 52. Not entirely by coincidence, it ignores almost everything that happened prior. Writers Andrew Kreisberg and Ben Sokolowski take over from #35 to an arc that didn’t please many fans, with Benjamin Percy relieving them at #41 to steer the series to its end (and into the next volume). In this period, Green Arrow also appear in Justice League of America and Justice League United; he made few guest appearances outside of those books. Green Arrow is an anchor of these initial issues. Convergence Green Arrow (2015) #1-2: This is post-Crisis Oliver Queen. New 52 Oliver Queen appears in Convergence #7-8 and Speed Force #2. 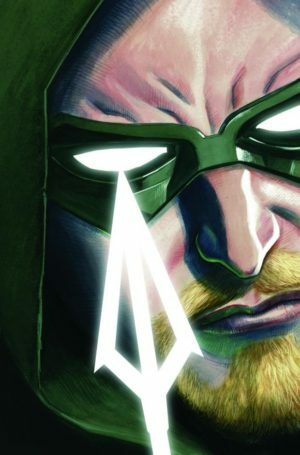 Launched by novelist Benjamin Percy as a twice-monthly-title, this Green Arrow is visually back to his old self with his classic facial hair but still has the continuity of the New 52 version. Black Canary periodically co-stars, although her and Oliver’s relationship has still been rendered forgotten by the New 52 change in continuity. Green Arrow has yet to make significant appearances outside of his title as of this writing apart from Death of Hawkman #2. See DC Rebirth Era for more information. Check Amazon for DC’s newest Green Arrow titles.